I may be the last person in the country to have seen King Kong, but it was on its last week in the cinema and the consensus seemed to be that this was one you really had to see on the big screen. I was in the mood for a blockbuster that didn't require strenuous use of the brain, and that's just what we got. KK is perfectly good entertainment - light on character and plot, heavy on gobsmacking special effects. My favourite parts of the movie were the beginning and the end, which were set in a gorgeous Depression-era New York. As soon as the boat approached Skull Island, the movie basically turned into a Jurassic Park/Indiana Jones style adventure with a triple helping of scary beasties and violent dismemberings: Dinosaurs, check. Big evil fanged bats, check. Tentacles-with-teeth, check. The one creature missing from this movie was the most important (and potentially fearsome) of all - the editor. Just because you can construct seventy-nine distinct species of disgusting overgrown insect-thing doesn't mean you should. I kept imagining Peter Jackson saying, "aww mate, let's just throw this one in, too. Go on." Strangely enough, yesterday I bought and watched a video of the original 1933 version from the charity sale held at the home of well-known Manchester aesthete Vincent Warmsley, who died recently. I enjoyed it again, as I always do. But I couldn't help but be struck by a reading of the film which hadn't occurred to me before. That is, quite apart from the fact that it's obviously a version of the beauty and the beast story, it's also a version of the white man's racist and sexual fear of the black man. Kong's abduction of Faye Wray is in the same tradition of the white man's transfer of his sexual anxieties and desires onto the black man that goes back to The Tempest and even earlier. Very thoughful comment, Roy. I haven't seen the original. I've always wanted to, but I've never managed to catch a revival and i just can't watch it on the small screen. I find that I feel that way about a lot of old, iconic movies, which means I'm probably missing out on a lot. I always interpret it based on race, colonialism as well as the psychological readings. 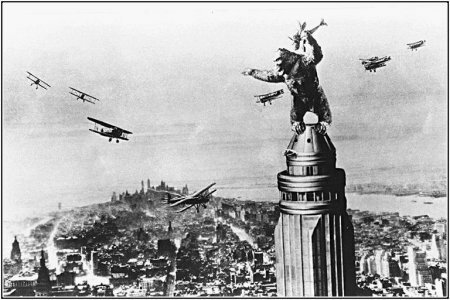 It is significant that Kong while ultimately tragic and doomed is also sympathetic, powerful, heroic, noble and capable of a wider degree of emotions than many of his colonial/capitalist captors, whose motives are largely based on greed and exploitation. I've not seen this yet myself. I dunno.. i just dont feel like it's my kinda thing. I never really liked the original plot line, and thought the movie way back when was more to showcase the then 'scary' effects. Nowadays we have more effects than plot in most movies, and i didnt fancy watching another!